USADA announced today that an independent Arbitrator from the American Arbitration Association, North American Court of Arbitration for Sport Panel (AAA), has rendered a decision in the case of Mohamed “Mo” Trafeh, a U.S. citizen currently living in Bouskoura, Morocco, and athlete in the sport of track & field. The AAA arbitrator found that Trafeh committed multiple anti-doping rule violations, including repeated use and possession of erythropoietin (EPO) and evading sample collection. The Arbitrator determined that in accordance with the rules of the World-Anti Doping Code, Trafeh’s multiple violations and other conduct qualified as aggravating circumstances, and imposed a 4-year period of ineligibility as well as a loss of results which includes a U.S. 15K National Championship, U.S. Half Marathon Championship and a record-setting U.S. 25k National Championship. During the arbitration hearing, USADA presented evidence to the independent Arbitrator including testimony from several witnesses under oath as well as other documentary evidence. After consideration of all the evidence presented, the Arbitrator confirmed that the evidence proved that Trafeh purchased EPO, transported EPO into the U.S., had used EPO since at least January 2012, and knowingly submitted false whereabouts information in an attempted ruse to both avoid testing and the consequences of an unsuccessful test attempt due to his failure to submit accurate whereabouts information to USADA. USADA proved that Trafeh was actually in the U.S. when USADA sent a doping control officer to his residence in Morocco to test him in February, 2014. EPO, which is a synthetic hormone used to stimulate the body’s production of red blood cells, thereby increasing oxygen transport and aerobic power, is a prohibited substance in the class of Peptide Hormones, Growth Factors and Related Substances. Its use, as well as Trafeh’s other offences, are in violation of anti-doping rules including the USADA Protocol for Olympic and Paralympic Movement Testing and the International Association of Athletics Federations (IAAF) Anti-Doping Rules, both of which have adopted the World Anti-Doping Code (Code) and the World Anti-Doping Agency Prohibited List. As a result of the sanction, Trafeh is also disqualified from all competitive results obtained on and subsequent to January 1, 2012, including forfeiture of any medals, points, and prizes. The disqualification includes Trafeh’s 2012 U.S. 15K National Championship, 2013 U.S. Half Marathon Championship and his record-setting U.S. 25k National Championship. The Arbitrator ruled that Trafeh’s period of ineligibility should begin on January 1, 2012, the date from which it was determined he first committed an anti-doping rule violation. Although the arbitrator’s decision was issued on December 2, 2014, USADA is releasing it today as USADA sought clarification of the start date of the sanction. In accordance with the WADA Code, USADA asked for the start date of the sanction to begin on the date of the decision. 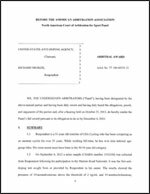 USADA received the independent Arbitrator’s confirmation this week of his initial decision to begin the sanction on January 12, 2012. USADA is considering its appeal rights concerning the sanction start date decision.